Can you imagine a future where your car is fueled by iron powder instead of gasoline? Metal powders, produced using clean primary energy sources, could provide a more viable long-term replacement for fossil fuels than other widely discussed alternatives, such as hydrogen, biofuels or batteries, according to a study in the Dec. 15 issue of the journal Applied Energy. “Technologies to generate clean electricity – primarily solar and wind power – are being developed rapidly; but we can’t use that electricity for many of the things that oil and gas are used for today, such as transportation and global energy trade,” notes McGill University professor Jeffrey Bergthorson, lead author of the new study. The Applied Energy paper, co-authored by Bergthorson with five other McGill researchers and a European Space Agency scientist in the Netherlands, lays out a novel concept for using tiny metal particles – similar in size to fine flour or icing sugar – to power external-combustion engines. Unlike the internal-combustion engines used in gasoline-powered cars, external-combustion engines use heat from an outside source to drive an engine. External-combustion engines, modern versions of the coal-fired steam locomotives that drove the industrial era, are widely used to generate power from nuclear, coal or biomass fuels in power stations. The idea of burning metal powders is nothing new – they’ve been used for centuries in fireworks, for instance. Since the mid-20th century, they’ve also been used in rocket propellants, such as the space shuttle’s solid-fuel booster rockets. But relatively little research has been done in recent decades on the properties of metal flames, and the potential for metal powders to be used as a recyclable fuel in a wide range of applications has been largely overlooked by scientists. 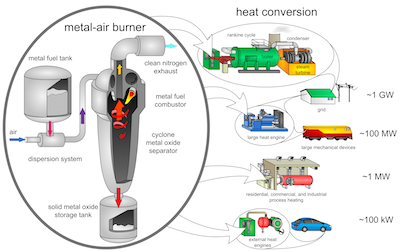 The idea put forward by the McGill team takes advantage of an important property of metal powders: when burned, they react with air to form stable, nontoxic solid-oxide products that can be collected relatively easily for recycling – unlike the CO2 emissions from burning fossil fuels that escape into the atmosphere. Iron could be the primary candidate for this purpose, according to the study. Millions of tons of iron powders are already produced annually for the metallurgy, chemical and electronic industries. And iron is readily recyclable with well-established technologies, and some novel techniques can avoid the carbon dioxide emissions associated with traditional iron production using coal. Co-author David Jarvis, head of strategic and emerging technologies at the European Space Agency, adds: "We are very interested in this technology because it opens the door to new propulsion systems that can be used in space and on earth. The shift away from fossil fuels for vehicle propulsion is a clear trend for the future. While not perfected and commercialized today, the use of low-cost metallic fuels, like iron powder, is a worthy alternative to petrol and diesel fuels. If we can demonstrate, for the first time, an iron-fueled engine with almost zero CO2 emissions, we believe this would then trigger even more innovation and cost reduction in the near future." Research on metal combustion at McGill has been funded over the past 20 years by the Natural Sciences and Engineering Research Council of Canada, the Canadian Department of National Defence, the U.S. Defence Threat Reduction Agency, the Canadian Space Agency, the European Space Agency, Martec Ltd. (Halifax, NS), and the Trottier Institute for Sustainability in Engineering and Design.